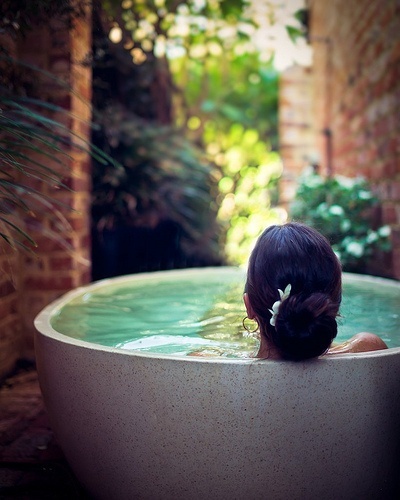 If you could have time for the most awesome bath……..
Home / Bathing / If you could have time for the most awesome bath……..
Where would it be ~ what would it look like ~ how luxurious would it be~ can you even imagine it? Would it be on the side of a mountain? Would it be on a screened in porch overlooking the ocean? Would it be in a beautiful room with a huge sunk-in tub like the one in the movie Pretty Woman? I imagine one at least half that size with maybe a few floating candles in the tub and the rest of the room filled with them. Scented candles with lavender and Bergamot, which is a light citrus scent, filling the air. And of course music playing but something soft and melodic with maybe some ocean sounds with waves crashing. And of course a glass of wine or a cup of tea. I would love to sit and just luxuriate in that warm water with some sweetly scented bath salts. Just relax and let my mind wander over how wonderful this feels to let go and just be with myself and my thoughts. I know so many people who say they do not have the time for a bath, that they are more shower people. But what if you made the time, what would be your perfect bath? Close your eyes and see what that would be like. Open the door to that room and see what it would look like. Could you take that image and make it real? OK as the saying goes- you know you are Southern when……. I make time for a bath every single night. It’s a ritual I won’t life without. Hot water, bottle of cold water, a good book and aromatherapy is part of my bedtime ritual. Sounds like a good ritual. I try at least once a week for sure if not more. Its like a need calling me there. I love to takes baths. When I had my tiny New York City apartment, it had a wonderful bathtub. I used to take baths before bed to relax me, and then shower in the morning to wake me up. Ever since I’ve lived in houses that had tiny tubs. As I’m searching for a new place to live, a great bathtub is on my must-have list. It would be definitely somewhere out in nature with beautiful round rocks as steps into a soothing pool of clear blue water. Sounds like an awesome image, I can really picture it! Now to make it abit more real. I was always a shower person, till we got a hot tub. Now I am both! LOL I love to luxuriate in it, looking up at the stars. Then I hit the showers for a good scent filled scrub. My version of heaven on earth. Thank you for reminding me how relaxing a bath can be. I would take a bath on a cliff overlooking over the deep blue sea. sounds wonderful doesn’t it! work it into your schedule! All of those baths sound wonderful. I’ll also take a simple tub full of hot water, a bar of soap and a washcloth. 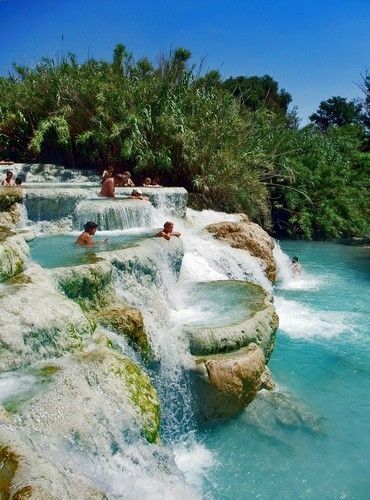 It would be in a hot spring, alone, surrounded by nature, and a soothing music playing in the background. While scented candles and aroma oils are delicately wafting through the air. That would be a relaxing bath for me. I always wanted to try the hot springs in Japan! We are going there on vacation and I can’t wait to try the hot springs in Kanagawa! You got me really excited thinking how it will feels like going in those hot springs, I hope it will be a good experience for me. This is great for people who love to take baths and for relaxation purposes.